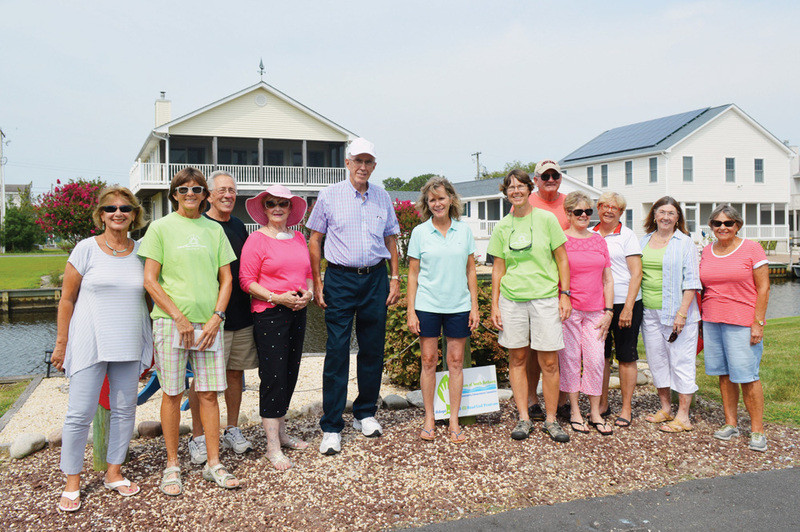 South Bethany canals got some love from residents in the 2018 annual Adopt-a-Canal contest. Here, town officials, volunteers and donors gather at the winning Kent Place location. What might otherwise be a lump of grass or scraggly trees has become a source of public pride, 35 times over. This year, residents upgraded three dozen canal ends to compete in the eighth annual contest. Besides the pride of having a peaceful, mini public park on their street, the Aug. 17 winners got some bragging rights and gift certificates from the Inland Bays Garden Center ranging from $50 for third place to $100 for second place and $200 for first place. This year’s awards were presented to: first place, Tammy and Pete Werner on Kent Place; second place, Bryant and Olivia Elrod on Sussex Place; and third place, Rich and Sue Juliano on Brandywine Drive. “What we like to see is neighbors contribute with either manpower or money,” Councilwoman and Community Enhancement Committee Chair Sue Callaway said. That’s why the third-place prize was accepted this week by Ronnie and Lou Dorso, two neighbors who answered the Julianos’ call for contributions. Canal décor was a family effort for the Werners, who have maintained their site since the Adopt program began. They wanted color. They started with a base of rocks in two different shades, the area enclosed by wooden railroad ties. The hydrangeas were planted several years ago, blooming pink and purple just in time for voting. The potted hibiscus are still hot orangey-pink, contrasting well with creamy white planters and a deep blue lounge chair (donated by a neighbor). The heavy lifting was done by their son, Bryan, and his wife, Colleen. Indeed, after the initial planting, it’s gotten easier for the canal-end connoisseurs, and Tammy Werner considered adopting a second canal end. Now, she definitely encourages others to adopt a canal end. And, after all their efforts, the neighbors just come, sit and enjoy the calm. “We go down there and sit on the canal … so you get a real nice view,” said Ronnie Dorso of her Brandywine site. Winners were chosen by popular vote in July. The South Bethany Community Enhancement Committee sponsors the annual adoption and contest. Callaway thanked the South Bethany Public Works Department and the residents who volunteered to spruce up South Bethany. “We’re into natives and restoring the bays,” said Cheryl Rehrig of the Inland Bays Garden Center. “And community,” added IBGC’s Denise Hoeksema. They also offer discounts to anyone beautifying the canals with native plants, which are low-maintenance and drought-tolerant.